ard competition out there has made tech brands push notebook’s speficications more and more towards the ultrabook profile but at the same price. Here is one high-performance and at the same time pocket-friendly machine that drew our attention. Digital Magnet presents Asus K55VD. The textured finish of the case contributes to the elegant uniqueness of this Asus. Our test unit came in brown but it is also available in pink, red and blue. The distinctive feature is the brushed silver aluminum wrist rest that keeps you palms cool even after long use. Let’s see if the hardware will live up to the prettiness of this laptop. 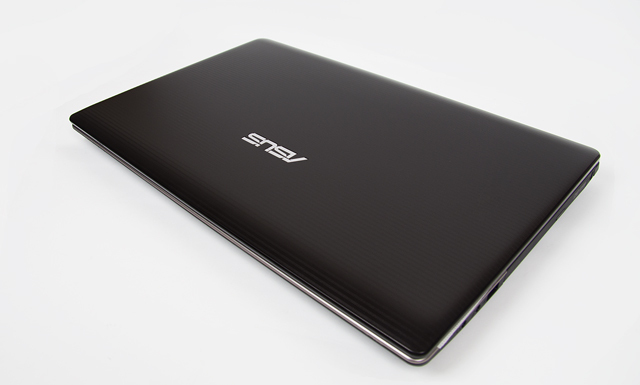 The Asus K55 VD features the fast 3rd generation IntelCore i7 processor. It has 6M cache and works at the working frequency of 2.4GHz but it can be overclocked up to 3.4GHz. The powerful performance is accompanied by dedicated graphics delivered by NVIDIA GeForce 610M with 2GB DDR3 VRAM. The dedicated graphic processor on board and the Ice Cool technology make this buddy a pocket-friendly gaming machine. The system memory is 4GB DDR3. The 15.6’’ display is LED backlit and works in full HD resolution. However the glare technology of the screen may cause you some trouble with reflections while working. The Altec Lansing speakers combined with Sonic Master Lite technology deliver excellent sound with rich and deep bass and we definitely give Asus thumbs up for delivering such a great audio experience on a laptop. The optical drive on board is DVD Super Multi but according to your needs it can also come with a Blu-Ray writer. The connection abilities on board include Bluetooth v4.0, 2 USB ports from the fast 3.0 version and one USB port from the older one. There is also an HDMI out, a VGA port and a two-in-one card reader. The webcamera shoots in 0.3MPs. Asus Super Hybrid engine 2 technology resumes the laptop from sleep mode in just 2 seconds. Thanks to the 4700mAh 6-cell battery it can stand by for two weeks and is always just 2 seconds away. The other cool feature is that the machine automatically backs up all the data you are using when the battery charge drops down to less then 5%. The SuperBatt technology of the battery delivers an extended battery life that according to Asus is three times that of normal notebooks. The island-style keyboard has well-spaced out keys while at the same time are big enough to provide accuracy. The numpad available here is another reason to call this laptop a gaming-orientated machine. The buttonless touchpad has big surface and supports multitouch gestures. Internal storage capacity can vary from 320GB up to 1TB 2.5’’ SATA drive. What is more this machine offers advanced security for your data thanks to the BIOS Booting password protection and HDD user password protection. The Asus K55VD comes loaded with Windows 8 platform.The machine’s weight is 2.25kg including the battery.